Keren Tsuriel Harari and Meir Orbach : 2018-12-05T17:22:43..
Airobotics Ltd. is developing automatic drones capable of performing security details and land surveys at factories, refineries, and mining sites. It does so from a hangar in Petah Tikva, a lackluster Tel Aviv suburb. The company was able to pick up some big names as customers, including Intel and BHP Group, and raise over $100 million. Now it is spreading its wings and moving its headquarters to the U.S. It is also setting its sights on an additional business: securing national borders. The drones developed here execute planned missions without a need for a human guide or operator: they take off from a large custom made box-shaped docking station and go about on their pre-assigned aerial missions—security patrols, and land and resource surveys. They’ll fly back to the crate for a recharge, storage, and sometimes for an automatic replacement of a specific camera or sensor. In landing, each drone releases a dongle that attaches itself to the docking station, before finally settling within the box. A robotic arm then gently moves the drone’s propellers and replaces its battery and sometimes sensors, in preparation for the next mission. Airobotics now plans to add some brain power to its flying patrol bots, giving them the ability to decide on a course of action in certain occurrences. One example: alerting security teams if trespassers are spotted. Founded in 2014 by Ran Krauss and Meir Kliner, Airobotics raised $101 million to date from high-level players including BlueRun Ventures, Charles River Ventures, and Noam Bardin, the Israeli-born CEO of Waze and a vice president at Google. 36-year old Krauss stumbled into the aviation industry by accident several years ago when he was shopping for a juice presser during a visit to Canada. He ended up buying a small drone and quickly became obsessed with flying, crashing, and assembling drones. 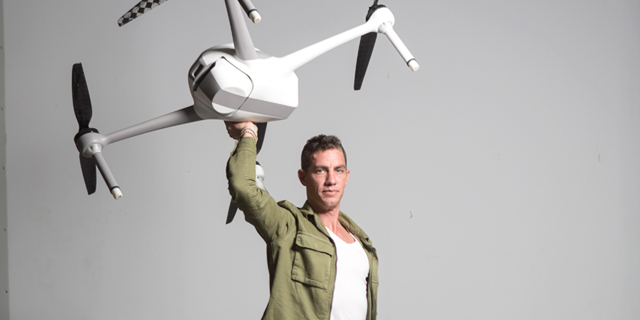 In the summer of 2012, Krauss was the first person to receive a license from the Civil Aviation Authority of Israel to fly unmanned aerial vehicles weighing up to 20 kilograms and launched aerial photography and cinematography service Bladeworx. Later that year, he co-founded Parazero Ltd., a company that developed automatic parachutes for drones, a technology incorporated in Airobotics’ vehicles. Airobotics currently has eight clients, including Intel’s factory in the southern Israeli town of Kiryat Gat and mining companies London-listed BHP Group Ltd., Australia-listed South32 Ltd., and Brazil-listed Vale SA. To grow revenues and attain profitability, Airobotics is going through some changes. Last week, the company announced it was moving most of its operations, including its global headquarters, to Scottsdale, Arizona, leaving only its research and development center in Israel. The company is also seeking to add experienced industry leaders to its ranks. Former Google and Facebook executive Richard Wooldridge, one of Airobotics’ seed investors, joined the company as a chief operating officer last year. As far as future plans are concerned, the company sets its sights on border security, including the long border between the U.S. and Mexico, according to Krauss. Many national borders now include fences with static sensors that send out an alert when the fence is touched. Sending a team takes time, and in case of a real threat, the perpetrator is likely to flee the scene by the time it arrives, Krauss said in an interview with Calcalist held in November. A drone parked on the border can get there in seconds and transmit video and audio to help determine the threat and monitor the situation until a team gets there, he added. He draws the line at adding weapons to the drones. “We decided to draw the line at physical intervention. The drone can use a flashlight to light the scene but not shoot tear gas or live ammunition,” he explained. Airobotics assembles the drones in-house. To meet demand, the production of the docking stations was recently outsourced. To streamline manufacturing and deployment, the company is trying to focus on specific countries, where it already has a presence. “Setting up shop in a new country or continent is a big deal,” Krauss said.